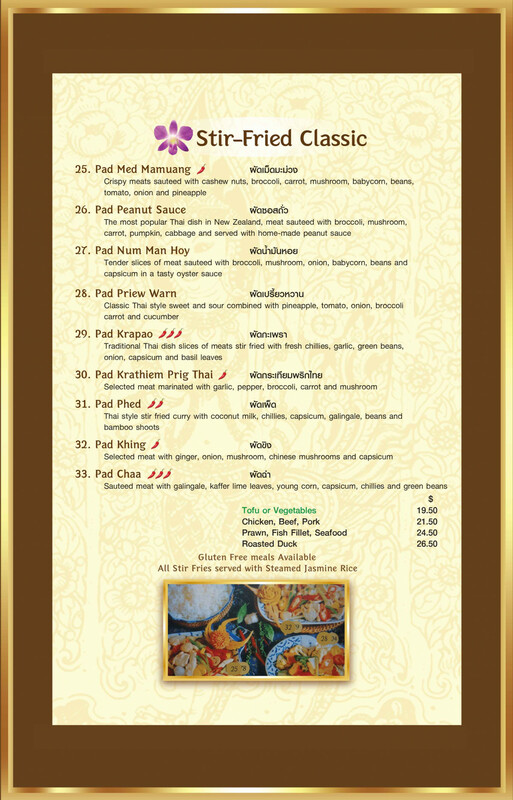 Enjoy authentic Thai cuisine and friendly service at Thai Orchid Restaurant on Riccarton Road, next to Christchurch Botanic Gardens. From the moment you walk through the door, you’ll feel right at home in this cosy restaurant. 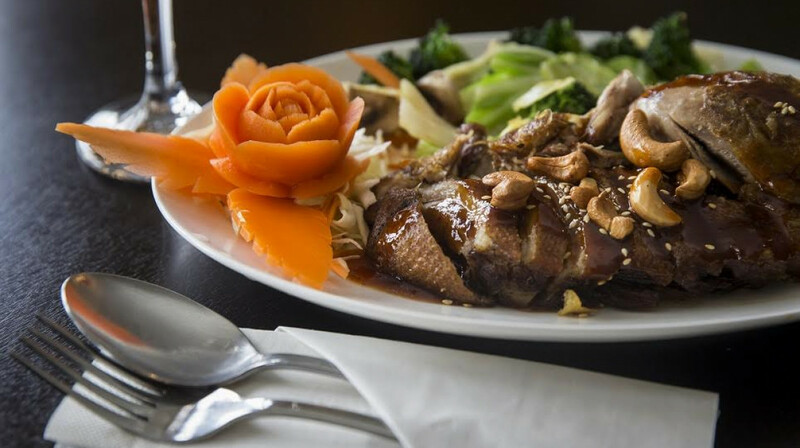 Combining 300-year-old recipes alongside contemporary dishes, the chefs at Thai Orchid pride themselves on creating fresh, delicious and moreish Thai food. Using traditional cooking methods and spices, you’ll love their lunch and dinner menu of coconut-milk curries, pad thai and stir-fried classics, as well as their house specials, such as New Zealand massaman lamb, deep-fried crispy fish fillets and sizzling tender beef. Whether you enjoy eating premium meat and seafood, or are vegetarian, vegan or gluten-free, there are plenty of natural and delicious options to choose from. 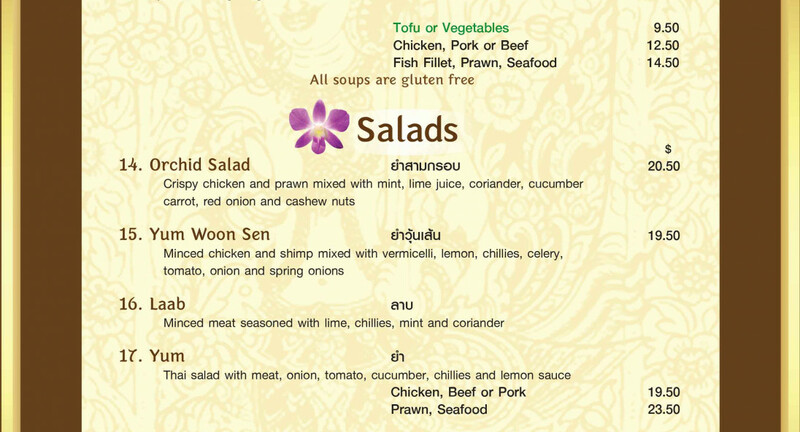 As everything is made fresh and onsite, you can also have the dish as spicy or as mild as you like, just let one of your waiters know which you’d prefer. 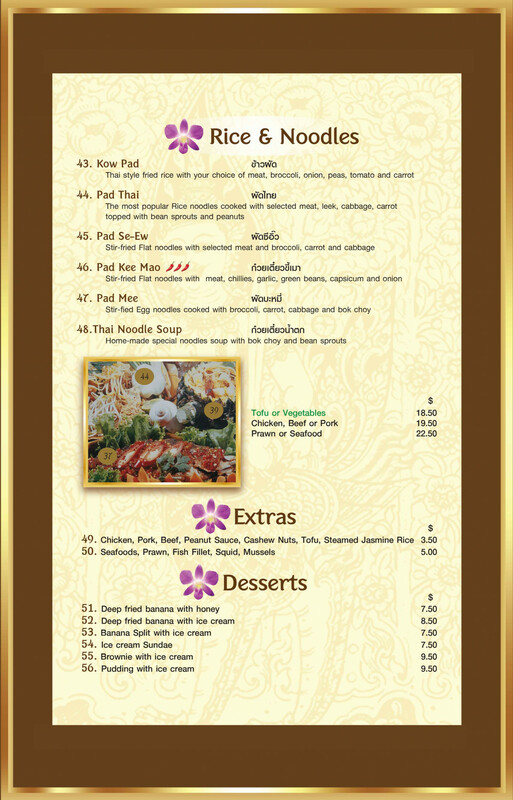 Definitely not one to miss when on the hunt for tasty Thai food in Christchurch! Lovely food and lovely people. Friendly, made you feel relaxed and welcome. Using first table and we were over charged but when i rang, they were very apologetic and happy to refund the amount the following day. Very happy customers. The staff were very friendly with big smiles, they made you feel very welcomed. The food was really good, great fresh flavours. As always food superb, staff great. Great atmosphere. 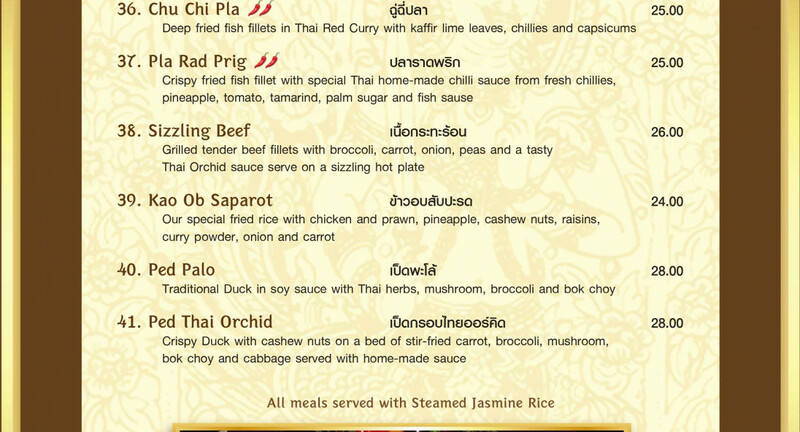 This is our third time to visit Thai Orchid . They never let us down ! 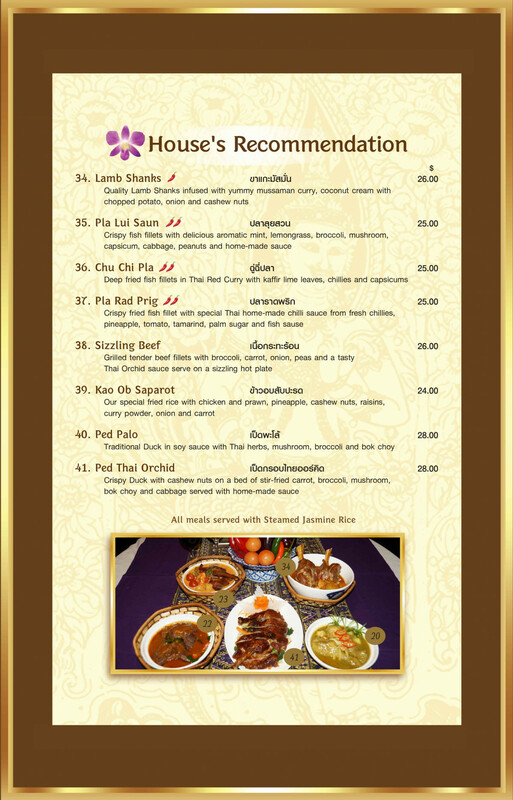 We loved salmon dish and sizzling beef dish , these are signature dishes . It was very busy night , but quick service and all stuff were soo friendly and lovely. They mad us feel so comfortable . Lovely food with friendly helpful service. 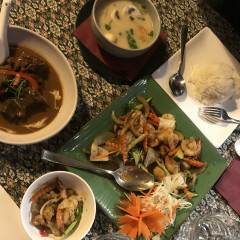 I decided to celebrate my birthday at Thai Orchid last night and my husband and I had a fantastic experience dining in this restaurant, as regular customers we feel that,l the food is amazing, the customer service is outstanding like no other restaurant we have been to. Highly recommend this place. Excellent food and service. I last came here a number of years ago and was disappointed, but it looks like new owners and chef have really turned things around. Lovely food. Friendly staff. Peaceful atmosphere. Recommend. 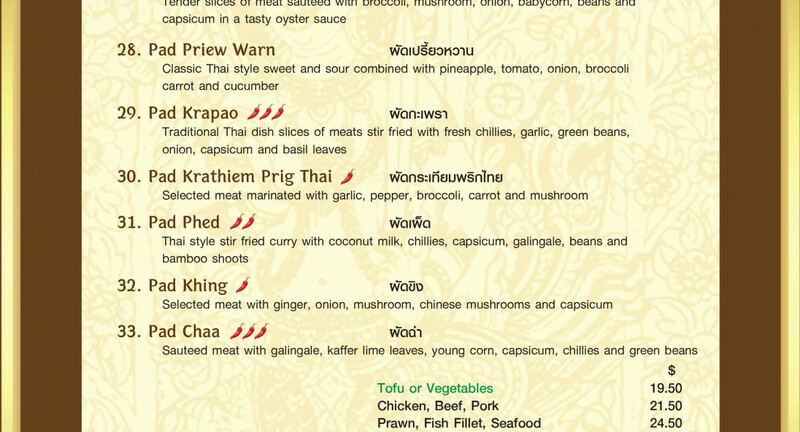 My partner and I dined In at Thai Orchid for the first time a few nights ago. 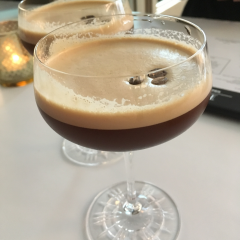 We were greeted when we walked in the door by a lovely, friendly and welcoming man who showed us to our table and the helpful service was continued throughout the night. We ordered two starters and two main dishes between us. The food was exquisite right from the start and pleased my partner and I beyond our expectations. A stand out dish was definitely the sizzling beef which was a perfect recommendation made from one of the staff for us. I would 100% recommend dining at Thai Orchid if you want amazing, well priced food that will not disappoint. We definitely will be returning many times in the future!! Great food and great atmosphere! The owner came out when we arrived and went through the menu with us and recommended the house specialty crispy duck, which we ordered and was delicious! The food was really yummy. Exceeded our expectations! However i think the restaurant space was quite small. And our table was too sunny. Food here is always great. Recommend the crispy duck. Tasty meal, fast service, friendly staff, very enjoyable. Great fresh food and service. We will be back. delicious food, friendly staff and a very nice place for family dinner. 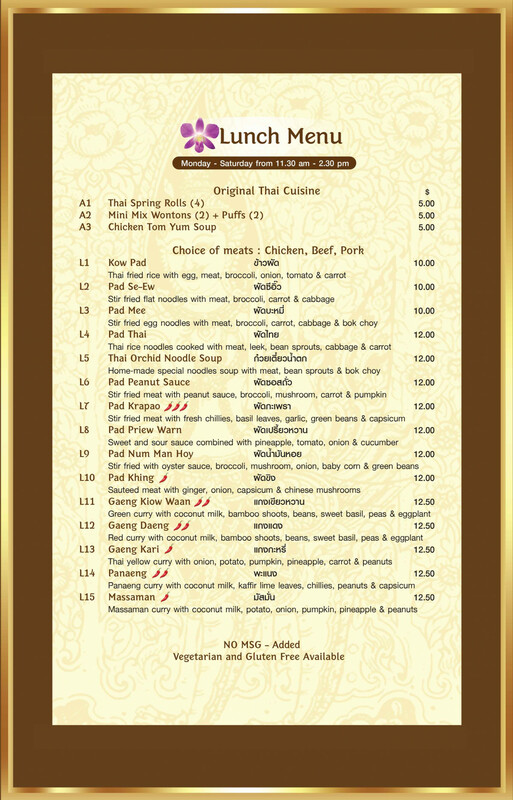 We dined at Thai Orchid last night for the first time using first tabl to book. The food was fresh & delicious, and presentation was great. 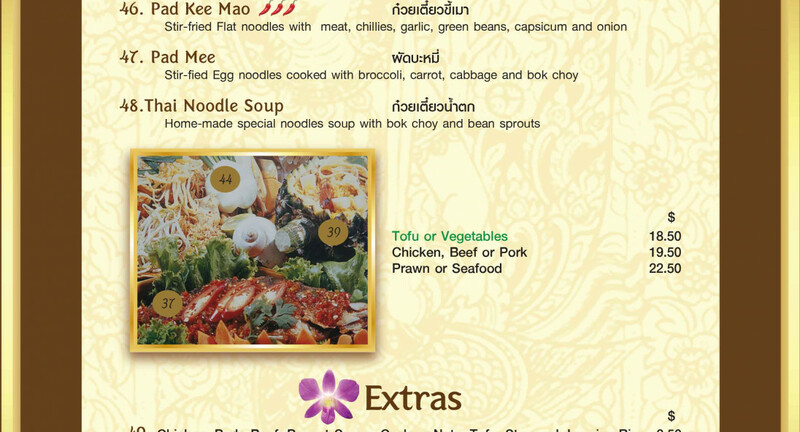 This restaurant have four traditional Thai Chefs so the food is fresh & authentic Thai. The service was impeccable. The host came a few times to the table to chat which I think adds a personal touch and the other staff were lovely. As the night went on they got busy busier, but the standard of service continued and staff always a smile on their faces. We will be going again. Very nice service, we had a great dinner at Thai orchid. The food is yummy. Staff are very nice, delicious food. Generous portions of very tasty food. Cosy surroundings. Will dine here again. Friendly and helpful staff, as well as amazing food! Couldn’t recommend enough! Don’t be put off by the decor. Three of us dined on the 9th feb - 6 fantastic dishes and service was faultless. 4th time we have been here on first table. Excellent food, friendly service. The food was amazing and so was the service, we will for sure be back! Great food and great atmosphere. Went there for our 7th wedding anniversary and staff were very attentive. Received complimentary bubbles to celebrate our night and meals were well sized to the point we had to get some to takeaway. Will be back!!! Really nice atmosphere and delicious food! The food here is so tasty and flavoursome. It was a busy Saturday night so took a while to attract the waiters attention but they were all really lovely and friendly staff. The banana fritter was amazing. beautiful flavours, the crisp skin chicken was worth fighting with my husband for the last piece! very fresh vegetables. We'll be back! Fantastic food experience with friends. Would come back. About the first to second table to be seated for the evening. A bit slow on the initial service, but in their defense they seemed to also be processing 20 Uber eats orders. Took longer than what I would expect to get our first round of entrees out. However the delicious food made up for that. The food never disappoints at Thai Orchard and our starter and meals were as delicious as always. Service was prompt too. Our table of 2 was right beside the open servery door and kitchen, which was noisy and draighty. When asked to be moved the friendly waitress explained that all other tables were reserved as they were fully booked that night, although even by the end of our early First Table dining I noted that the restaurant was still only half full. However, our waitress did make a point of carefully closing the door after each kitchen exit, and I did appreciate that. Customer service was exceptional! Our food was simply delicious! Can't wait go back! Fabulous staff and a really lovely meal ! We had a beautiful meal celebrating our wedding anniversary . 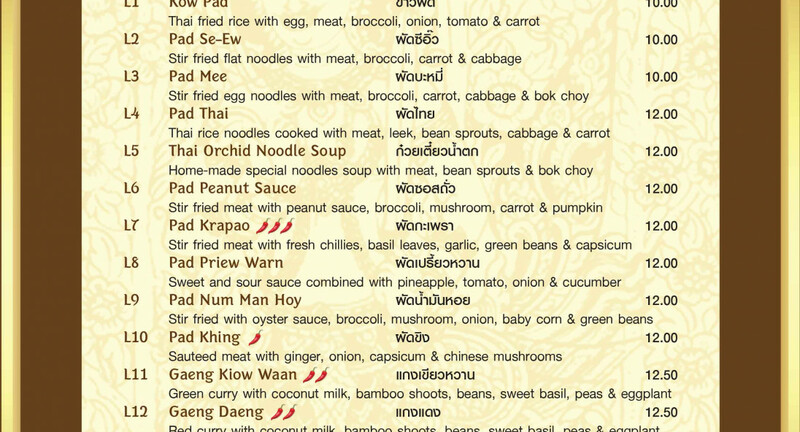 The thai meals were excellent . 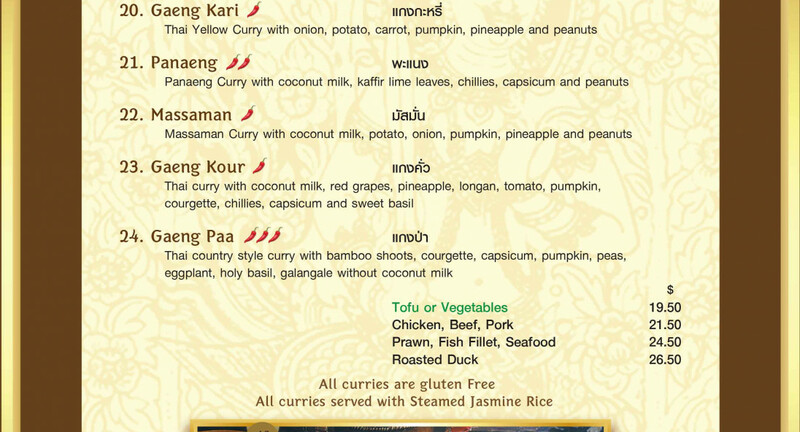 We had the crispy duck and yellow curry and they were amazing - so tasty. It was a very pleasant atmosphere enhanced by the decor and background music. The manager and waitresses were knowledgable friendly and attentive . They explained the menu very well. A highlight for me also was the complimentary champagne to celebrate our anniversary. 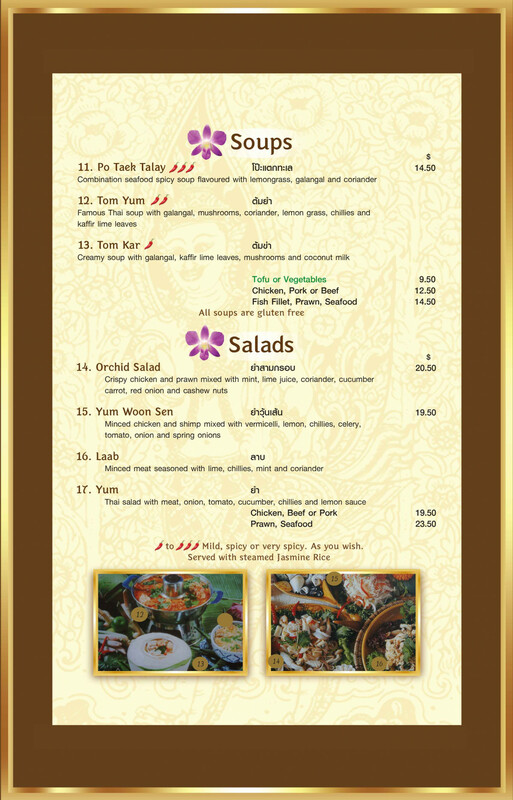 Thai Orchid is a top restaurant with excellent food and service. Thank you so much Julz and his team. We will be back!! Always a great atmosphere, customer service is always great, the workers are always happy! Felt very welcome. the menu was explained in detail. We chose the salmon which was amazing and a generosity size. 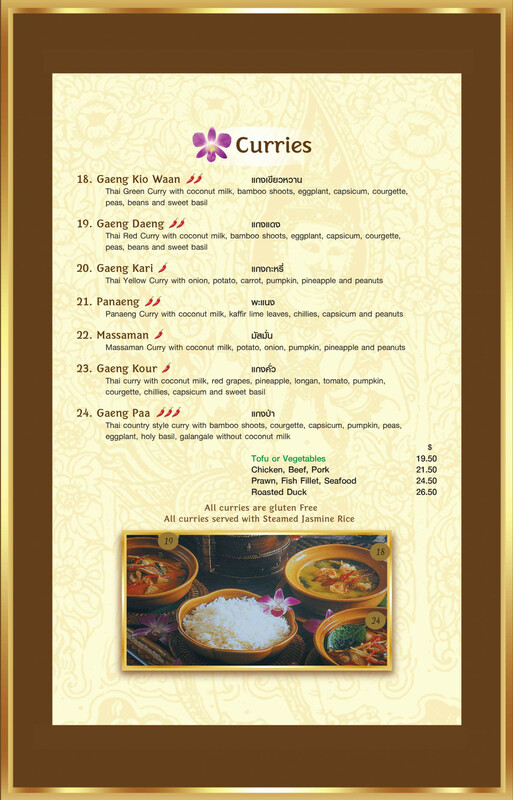 A great place to come for dinner with authentic that cuisine,ba good selection of drinks and music to relax to. That is my third time to visit Thai Orchid. Food was amazing as always. Service was bit slow but staff were lovely customer service. We had some good food for our dinner out but it felt like the restaurant was way overbooked. we had great service to begin with but it just became crazy busy and our meals took ages to arrive. The people running this place seem great and I can recommend the sizzling hot plate. Food came quickly and tasty. Probably where we were seated wasn't ideal for a relaxed meal... it was just by the door where food and dishes were constantly flowing.